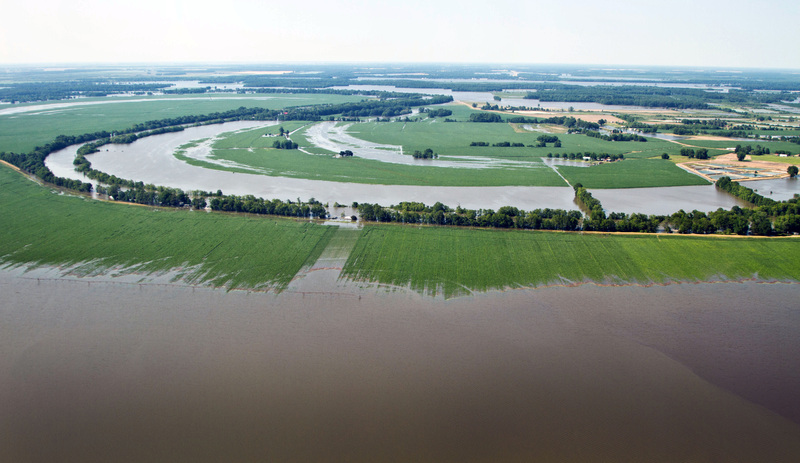 Aerial view of Mississippi River flood levels and inundation of farm, wilderness, and populated areas, on Thursday, May 19, 2011. from the MS side. Onboard passengers included Representative Bennie Thompson (blue shirt), and U.S. Department of Agricultureâs Undersecretary for Rural Development Dallas Tonsager (white shirt); Acting Under Secretary Farm and Foreign Agriculture Service Michael Scuse (black coat); Rural Development State Director Trina N. George (tan blouse) and County Executive Director Aaron C. Robinson Sr. (plaid shirt). Aerial platform was a UH-60 Blackhawk commanded by Col. Kennedy and his flight crew from the Army Aviation Support Facility #1 at Hawkins Field in Jackson. USDA Photo by Lance Cheung. Photo by U.S. Department of Agriculture.